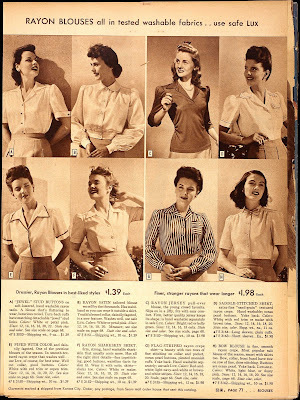 I was browsing through the 1943 Sears fall and spring catalogues (courtesy of ancestry.com) and came across some similar blouses to the DuBarry 5327 from my last post. What about you? 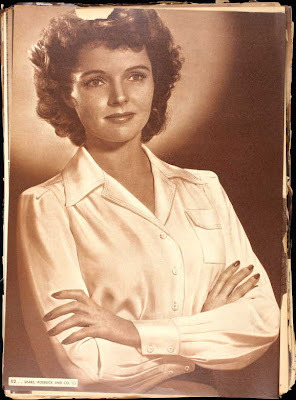 Any classic wardrobe sewing projects in your future? White shirts are the bomb... I'm actually planning a wardrobe of statement pieces at the moment, since most of my clothes are classic wardrobe staples. In the photo that you love? I think that's the mom from Father Knows Best! I can't remember her name right now but that sure looks like her. I am definately going to be sewing high waisted trousers! Those photos are fabulous. Thanks for sharing. Jane Wyatt! What do you think? In my mind is installed a high-waisted trousers 40's style soon. Did you get my email? I love the basic, white shirt--I need to add some to my wardrobe! But I think what might tackle next that is "basic" are some tshirts... Those I really need right now! lol. I really need to get onto sewing some separates. I've been wanting to try the sencha blouse again for months! I have very few separate patterns and the majority of them are contemporary, I have to start collecting more skirt and blouse patterns. 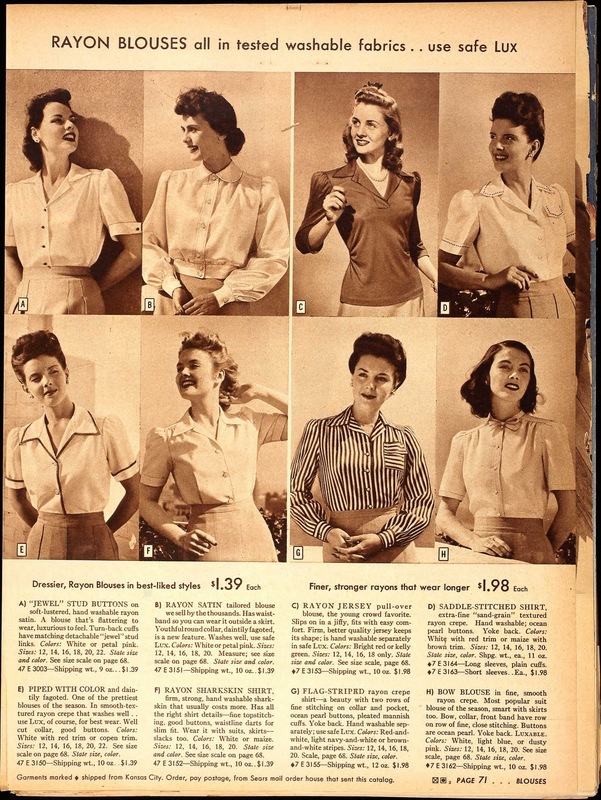 I LOVE blouse H, the Bow Blouse--the fourth to the bottom left. Definitely something I'd want to make, even in the original "dusty rose" option. Thanks for the images! 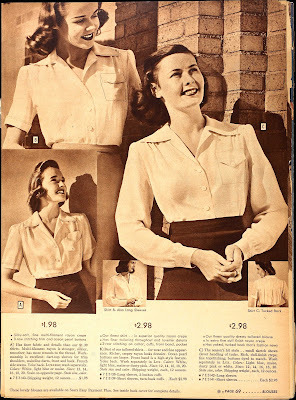 I need to make some basic white blouses. I have a ton of skirts and trousers and not enough blouses to wear with them. @Isaspacey---hmmmm...you may be right! That does look very much like her! @Sarah--I love 'h' too...and dusty rose would be such a classic color! What perfect photos! I particularly love the woman in navy slacks, the white blouse and penny loafers. Thanks for sharing these pictures! I was just noticing the other day that my two white blouses could really stand to be replaced and have been contemplating making some myself. Pretty, pretty! I'm looking forward to tomorrow's post so I can see the finished shirt. :) I am planning on making a white tuxedo style shirt for me. Fun images!! Thanks for sharing. Now I want a basic white shirt! This is a bit random and strange but I was watching Lark Rise to Candleford and one of the ladies had a starched white blouse on and I thought, I miss wearing a nice white blouse, obviously it wouldn't be that particular era!! But yes that's on my list of things to do too! I am about to embark on a white linen blouse, just can't decide on the pattern. I'm torn between a classic blouse - similar to those above - using an 80s? pattern or a more contemporary pattern from BWOF magazine. Maybe I'll make it easy for myself and do both! 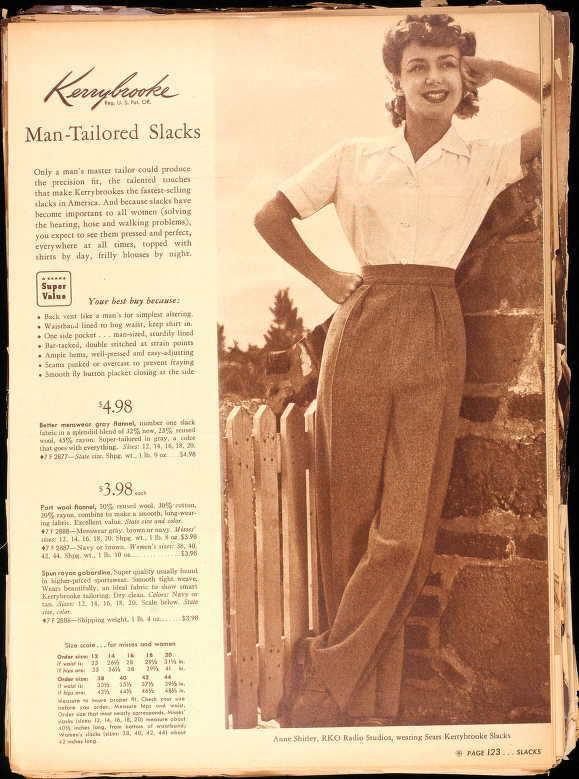 I don't know what people have against the high-waisted pants of yesteryear. 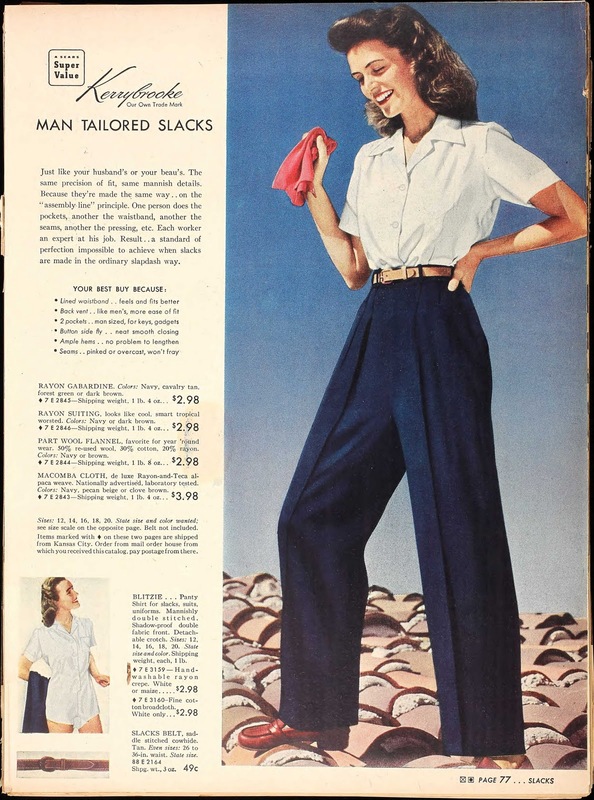 I think the pants in the photos you posted make women look long lean, and they accentuate a tiny waist. What's not to love? !